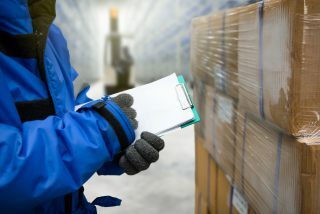 Cold Storage Warehouse: When and Why Do You Need It? Warehouses make up a $20 billion industry over the United States. But that’s not just from dry storage. There are some products out there, like perishable food, that can’t survive in normal storage conditions. If you have any products like that, you need to look into getting a cold storage warehouse. This complete cold storage guide will tell you everything you need to know about what cold storage is, what it does, and what kind of products it benefits. The only difference between cold storage and dry storage is that cold storage is… cold. There are a lot of businesses out there that handle perishable or temperature sensitive products. Cold storage warehouses give them a place to store those products safely. But cold storage services aren’t just a way to store your product, it’s a good way to ship them too. Cold storage services will process, package, and deliver your goods almost anywhere in refrigerated couriers, meaning the temperature stays exactly how it should the whole trip. Can’t I Just Store My Temperature Sensitive Products in My Own Cold Storage? If you have a cold storage room in your company building and all your products fit inside, you can keep them there if you prefer. But you’ll still need refrigerated courier vans to transport your goods when it’s time to deliver. You may be able to get by with your own cold room if your business is small or if you’re just starting out. A cold storage warehouse comes in when your business starts to grow. At some point, you’ll need more products than you can fit in your cold room. And that’s a good thing! A bigger business means bigger benefits, including a wider customer base. You should think of warehouse storage as a tool that will help you continue to grow and expand your business. It keeps your products at a set temperature of your choosing, which keeps them fresh and makes them last longer. For example, say you need to store fresh fruit and vegetables. Keeping them at the right temperature will reduce the risk of damage and extend their shelf life. These same foods stored in a warm environment will mold faster and attract pests. Perishable foods stored at the wrong temperature will spoil, leading to changes in color, texture, and flavor. Eating food that hasn’t been kept at the right temperature will also increase your chances of getting food poisoning. Obviously, that isn’t something you want to risk with your products. Not just food, if that’s what you’re thinking. All kinds of businesses use cold storage services for all kinds of products. So before you click out of this article because you think it’s not for you, take a look at some of these other items that benefit from cold storage warehouses. Unless you live somewhere very cold, your candles shouldn’t be stored in a normal warehouse facility. When the temperature warms up, the candles will start to melt, which can ruin their shapes or mix separate colors together. If they only need to be stored for a short period of time (and we mean short), you may not need to worry too much about the temperature. But any storage time longer than a few days should warrant using cold storage. This will help them last longer and keep their unique colors and designs. Any camera film should be stored in a cold environment. This keeps the film from getting damaged. Though film isn’t very popular anymore, there are a lot of people out there who still use it. So knowing how to store it correctly could save you a lot of trouble. Artwork should be kept in a temperature controlled storage facility, especially if they are old pieces. If the art gets too hot, the colors could fade. In some cases, the paint can even start to peel off the canvas. Again, this may not be a big concern if you’re only storing the paintings for a few days. But long storage times need the right temperatures to preserve the paint. The cold keeps plants fresh and healthy. Cut flowers, like for a bouquet, last longer in cooler temperatures, which keeps them from withering up. Even seeds do well in cold storage. If they’re placed in a moisture-proof container the cold will make them last longer than usual. Cold storage means a longer shelf life for lipstick and a lot of other cosmetics for that matter. When stored this way, they will last longer and stay in better condition. The same can be said of cologne. It can actually keep its scent for a longer period of time if it is kept in cold storage. But this does not work the same for perfume. All perfumes should be stored at room temperature. Cold storage won’t do them any good. Some types of medicine need to be kept cold to ensure they don’t get contaminated. Things like blood samples and other medical supplies must be preserved in cold temperatures to keep them fresh for later testing. How Can a Cold Storage Warehouse Help You? There are a lot of different products that need cold storage to stay in good condition. It isn’t just for meats, fruits, and vegetables. And the examples above were just a short list of items that should be stored in temperature controlled environments. A cold storage warehouse can store your products at the right temperatures and even keep them that way during long trips. This means you don’t have to worry about things like that anymore and can turn your attention back to running your business. If there’s a way our cold storage services can help you, we would love to talk with you. Contact us and we’ll help you figure out what storage options work best for you.